Colonies of stray cats can cause a number of problems for the community, including noise, destruction of property and, most insidiously, conflict between neighbors. 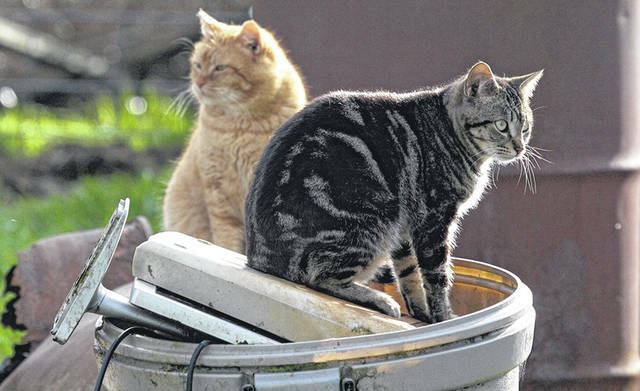 DARKE COUNTY — The City of Greenville and other communities in Darke County have an unwanted cat problem. “It’s a proven fact that one male, one female and their offspring can produce a million cats in a 10-year period,” Darke County Humane Society President Judy Francis said. As a result, the Darke County Animal Shelter has stopped taking in unwanted cats, and the Humane Society is having a hard time picking up the slack, according to Francis. Colonies of stray cats can cause a number of problems for the community, Francis said, including noise, destruction of property and, most insidiously, conflict between neighbors. Some advocate killing stray cats to reduce their numbers, but even such an extreme measure doesn’t do much good, according to Francis. The solution, Francis said, is to reduce the stray cat population through attrition. Under the TNR program, cats brought into the Humane Society are neutered and then released, rendering them incapable of producing more offspring. As a result, colonies of stray cats gradually will shrink, as a colony will not accept new members from outside its bloodline. Francis said that similar programs have been implemented successfully in cities such as Washington, D.C., Tampa and Atlantic City. In order to do more, Francis stressed, the Humane Society needs more financial support. Supporting the Humane Society’s efforts is in the best interest of Darke County residents whether they are cat fans or not, according to Francis. As for county support, Darke County Commissioner Matt Aultman said that dealing with stray cats is not a part of the county government’s mandate. Francis said she was grateful for the work municipal governments have put in. This entry was tagged Cat, Cats, Darke County Animal Shelter, Darke County Humane Society, Feral cat, Feral cats, Greenville, Humane Society, Stray cat, Stray cats. Bookmark the permalink.